Replacement 1.2-volt NiCad Rechargable Battery For our Solar LED Post Cap Lights & other Solar Lighting Fixtures. Two AA Solar Ni-Cd Rechargable Batteries ensure long lighting power: up to 12 hrs of light when used with most of our our Solar Post Caps. The NiCd Rechargeable battery comes individual or in a package of four. These AA batteries have a 1.2 voltage @800mAH. They are replacement solar batteries and contains Nickel-Cadmium. Install batteries in the morning and allow them to charge throughout the day. For non-solar applications, the batteries should be charged using a standard NiCd AA battery charger. Standard charge time: 15 hours max @60mA. Remove the 2 exsisting batteries. Make sure the metal contacts are free of rust or corrosion. If you need to clean the, you can use a nail file or sand-paper. Clean till shiny. Turn the on/off switch to the OFF position to fully charge the batteries. Your solar post cap light will need 24-48 hours of sunlight to fully charge. Place your solar post cap light in direct sunlight for 24-48 hours with the switch in the OFF position to fully charge. 4. Make sure the batteries are making contact with the terminals and the contacts are clean..
From Greta Seay of Clermont, Florida on 5/21/2013 . 3/24/2014 – If my rechargeable AAA solar battery gets wet, is it permanently damaged or can I dry it and reuse it?? 5/9/2013 – you refer to an on/off switch in the solar post cap. Where is the switch exactly. 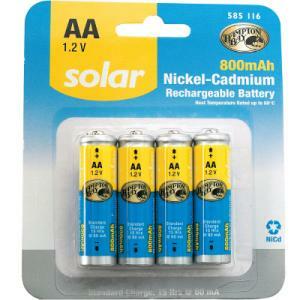 11/4/2012 – lookig for : 400 mah AA 1.2 volts nickel cadium solar batteries. 9/26/2012 – We have the 6X6 Tiffany Style solar glass post cap-mission. Do you sell Solar collectors and if you do, how much are they . . .
6/30/2012 – Can you use regular rechargable batteries in solar lights or do they have to be solar rechargable batteries?